The StockCharts Technical Rank (SCTR) is a numerical score that ranks a stock within a group of stocks. 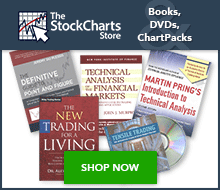 The methodology for these rankings comes from the wisdom of John Murphy, author of many books on technical analysis and contributor to the Market Message at StockCharts.com. Stocks are assigned a score based on six key indicators covering different timeframes. These indicator scores are then sorted and assigned a technical rank. Using SCTR tables, chartists can sort stocks according to their technical rank, making it easy to identify the technical leaders and laggards within a specific group. As with all technical indicators, SCTRs are designed to be used in conjunction with other indicators and analysis techniques. For example, chartists can use SCTRs as a filter when there are too many signals, weeding out stocks showing relative weakness and providing a manageable subset for further analysis. Note that leveraged and inverse ETFs are excluded from the SCTR rankings for the ETF universe. Above-average volatility and inverse movements skew the results. The VIX ETF (VXX) is also excluded because it moves inverse to the S&P 500. It takes two steps to calculate the StockCharts Technical Rank (SCTR). First, each stock is “scored” based on six different technical indicators. These six indicators can be subdivided into three groups: long-term, medium-term and short-term. The box below details these indicators, the relevant timeframe and the weightings. Except for the 3-day slope of the PPO-Histogram, the raw numbers are used to calculate the indicator score. For example, if a stock is 15% above its 200-day moving average, then this indicator will contribute 4.5 points to the total indicator score (15 x .30 = 4.5). If the 20-day Rate-of-Change is -7%, then this indicator will contribute a negative 1.05 points to the total indicator score (-7 x .15 = -1.05). For the PPO-Histogram, if its slope is greater than +1 (i.e., +45 degrees), 5 points (5% of 100) is contributed to the total indicator score. If the PPO-Histogram's slope is less than -45 degrees, 0 points are contributed to the score. Otherwise, 5% of ((Slope + 1) x 50) is contributed. After this first calculation round, StockCharts.com then ranks these stocks by their indicator score. Keep in mind that these stocks are ranked solely within their group, such as large-caps, mid-caps and small-caps. This article will first show a simplified example using ten stocks sorted by indicator score. The stock with the highest score gets the highest technical rank (10), while the stock with the lowest score gets the lowest technical rank (1). The rankings are then filled in according to the indicator score. StockCharts Technical Rank goes into much more detail. First, the rankings extend from 0.00 to 99.99, with 0 being the absolute weakest and 99.99 being the absolute strongest. No stock will score a perfect 100. Second, StockCharts.com creates “buckets” (akin to percentiles) to sort the stocks within a group. Using an example with a universe of 500 stocks, ten equal buckets would be created and each bucket would have 50 stocks (50 x 10 = 500). The 50 stocks with the lowest indicator scores go into the bottom bucket and have SCTRs ranging from 0 to 10. The 50 stocks with the highest indicator scores go into the top bucket and have SCTRs ranging from 90 to 99.99. Each bucket will then be filled accordingly and further sorted within the bucket. The end result is 500 stocks ranked from 0 to 99.99 and spread relatively evenly across the ranking pool. The indicator score is unique and powerful because it accounts for several timeframes, rather than being tethered to a specific one. A stock must score well with all indicators and all timeframes to earn a top indicator score and technical rank. The indicator score puts more weight on the two long-term indicators, which account for 60% of the total score. This makes sense because the long-term trend is the strongest force. The weightings decline as scoring moves to the short-term indicators. The medium-term indicators account for 30% and the short-term indicators account for 10%. Together, the long-term and medium-term indicators account for 90% of the total score. The StockCharts Technical Rank shows how a stock is performing relative to its peers, not a benchmark index. Indices, such as the S&P 500, are dominated by large-caps and may not truly reflect the market as a whole. Instead of benchmarking to one index, SCTR sorts all stocks within a specific universe, such as large-caps, mid-caps and small-caps. In this regard, chartists can see how Apple is performing relative to Amazon, IBM and other large-cap stocks. SCTR tables can easily be sorted to separate the strongest stocks from the weakest. In any given SCTR universe, the top 10% will rank between 90 and 100, while the bottom 10% will rank between 0 and 10. A stock scoring 50 would be average, showing neither relative strength nor relative weakness. In general, scores between 40 and 60 are considered average. Signs of technical weakness start to appear as scores move below 40. Signs of technical strength emerge when scores move above 60. In order for a stock to have a SCTR value, it must first belong to a “Universe.” Universes are large groups of stocks established by StockCharts.com for the purpose of relative strength ranking. A stock can only belong to one SCTR Universe at a time. Currently, we use country and/or market capitalization to determine which universe a stock belongs to. The SCTR Universes are “re-balanced” each year around June 1st. There are two percentage-based long-term indicators. First, the indicator score accounts for how far a stock is from its 200-day moving average. A stock is in a long-term uptrend when it is above the 200-day moving average and in a long-term downtrend when it is below. The distance from the 200-day moving average line determines the trend's strength. A strong uptrend is present when price is well above the 200-day. Conversely, a strong downtrend is present when price is well below the 200-day. The 125-day Rate-of-Change is the second long-term indicator. This is a simple indicator that measures the percentage price change over the last 125 days, which is around six months. Strong stocks will show the largest gains, while weak stocks will show the largest losses. It is a straight-forward indicator designed to measure pure strength or weakness. The first chart shows Home Depot with the 200-day moving average and the 125-day Rate-of-Change indicator. At the time this chart was created, HD had an SCTR score of 97.4. Price was over 40% higher than its moving average and the Rate-of-Change was above 20%. Such strength in these long-term indicators packs a big positive punch for the technical rank. The second chart shows Whirlpool (WHR) with the same indicators, but a completely different technical picture. Note that WHR has a SCTR score of 3.50, which is in the bottom 10%. The stock is trading over 25% below its 200-day average and the 125-day Rate-of-Change is below -30%. WHR recently hit a new 52-week low, which is indicative of a long-term downtrend. This weakness is clearly confirmed by the low technical rank. The next two indicators cover the medium-term picture. A 50-day moving average covers around 2 1/2 months of trading. A stock is trending higher when above the 50-day moving average and trending lower when below the 50-day. This positive effect is compounded when a stock is trading above both the 200-day and 50-day averages. The converse is true when a stock is trading below both moving averages. The 20-day Rate-of-Change measures the percentage price change over a 20-day period, which is about a month. Again, stocks with big positive price changes over a 20-day period show above-average strength that will be reflected in the technical rank. A big decline over a 20-day period would negatively affect the technical rank. The first chart shows Home Depot with the 50-day average and the 20-day Rate-of-Change indicator. Remember, HD had an SCTR score of 97.4 at the time this chart was created. Medium-term, price was over 10% above its 50-day average and the 20-day Rate-of-Change was greater than 9%. Those are mighty strong numbers. The second chart shows Whirlpool (WHR) with the same indicators, but a completely different technical picture. Remember, WHR had a SCTR score of 3.50 on December 5th. The stock was trading over 5% below its 50-day moving average and the 20-day Rate-of-Change was below -2.5%. These numbers are not that drastic and definitely an improvement over the levels seen in late November. However, ranked against other large-cap stocks, these negative numbers did not help Whirlpool and kept its technical rank in the bottom 10%. The two short-term indicators account for 10% of the indicator score. First, 14-day RSI is used to gauge short-term momentum. Developed by Welles Wilder, this classic momentum oscillator fluctuates between 0 and 100. High levels (above 60) reflect bullish momentum while low levels (below 40) indicate bearish momentum. The 3-day slope of the PPO-Histogram is also used to gauge short-term momentum. The Percentage Price Oscillator (PPO) measures the percentage difference between the 9-day EMA and the 26-day EMA of a stock. The PPO-Histogram is the difference between the PPO and its 9-day EMA. In a sense, the PPO measures momentum and the PPO-Histogram measures the momentum of the PPO. Taking this indicator one step further, the 3-day Slope of the PPO-Histogram measures the degree of change in the PPO-Histogram over a 3-day period. The slope is simply the rise over the run (rise/run), which is the 3-day change in the PPO-Histogram divided by 3. SharpCharts does not have an indicator for this, but a quick look at the charts tells us if the slope is positive or negative. We can also see when the slope is relatively steep or flat. A steep slope reflects a sharp change, while a flat slope reflects a slight change. The first chart shows Home Depot with 14-day RSI in red and the Percent Price Oscillator (PPO) with its histogram in the indicator window. Keep in mind that HD has a SCTR score of 97.4. RSI shows strength because it was trading above 70 at the time. In fact, notice that RSI was at its highest level in over six months. This strong reading contributed to the high technical rank for HD. The last three bars of the histogram define the slope. There is a sharp rise from the first bar to the third, which is a positive slope. The second chart shows Whirlpool (WHR) with the same short-term indicators. Remember, WHR had a SCTR score of 3.50. 14-day RSI bounced off its late November low, but remains below 50. Short-term momentum is neutral at best, slightly bearish at worst. The 3-day slope for the PPO-Histogram, however, is positive. Notice that the first bar is in negative territory and the third bar is in positive territory. The rise is not that steep though. This indicates that the 3-day slope of the PPO-Histogram is not contributing that much to the indicator score. Additionally, keep in mind that this indicator accounts for just 10% of the total score. The StockCharts Technical Rank feature can be accessed from the SCTR Reports page. Once on the page, users can choose their stock universe. Chartists can also choose between end-of-day and intraday. End-of-day is based on the most recent daily close, while intraday is based on price levels at that particular point in time. Indicators, such as the 14-day RSI and the 200-day Moving Average, are based on those same price levels. Once working with a SCTR table, users can sort the columns with the double arrows. Sorting can be by industry group, SCTR, SCTR Change, or Close. The SCTR change is the change in SCTR values from one period to the next. Sorting by this column will show chartists which stocks had the biggest changes in their technical rank. This feature can be used to spot big movers. Note that leveraged and inverse ETFs are excluded from the SCTR rankings for the ETF universe. Above-average volatility and inverse movements skew the results. The VIX ETF (VXX) is also excluded because it moves inverse to the S&P 500. Click here to see the StockCharts Technical Rank page live. The StockCharts Technical Rank (SCTR) separates the wheat from the chaff. Relative strength is an important part of a successful trading or investing strategy. Based on the wisdom of John Murphy, SCTR allows chartists to compare the technical strength of one stock against all the stocks in its peer group. Chartists can also group stocks according to the technical rank. Stocks in the top 30% will have a technical rank of 70 or higher. Chartists can then focus on these relatively strong stocks for potential long positions on pullbacks. Conversely, chartists can use the technical rank to avoid weak stocks, such as those with a technical rank below 40. As far as new trends emerging, chartists can look for stocks with technical ranks moving out of the middle zone (40-60). A move above 60 would show relative strength improving, while a move below 40 would show an increase in relative weakness. As with all technical tools, SCTR should be used in conjunction with other aspects of Technical Analysis. This scan reveals stocks where the SCTR for a US stock has just crossed above 90. The 'or' clause includes all US stocks with SCTR values, regardless of market cap. This scan reveals US ETFs that are having a new 6-month high SCTR value. Because the scan covers a limited number of securities in a single SCTR universe, the typical scan clauses for defining the universe are not necessary here. Q: The SCTR value has been the same for XYZ for a while now, why is that? A: That means it is consistently outperforming/underperforming its peers. Q: How often are SCTRs updated? A: During the trading day, SCTRs are updated every 1-2 minutes.